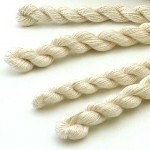 5g skeins of gorgeous undyed pure silk in a range of thicknesses. 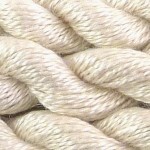 A gorgeous range of 100% pure mulberry super spun silk yarns in a range of six different thicknesses. 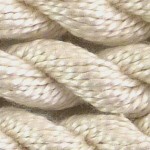 This silk really is the height of luxury with a glossy surface and smooth texture. This undyed silk is perfect for you to dye to your own shades and is available in two useful sizes. 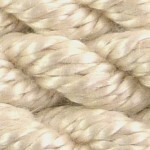 Any project created from spun silk has the element of luxury that can’t be achieved with any other yarn. Many degree students use silk for final collections as it highlights their skills beautifully, designers making couture pieces choose silk for the most glamorous of looks, and mere mortals find that silk is a thread to be used once we’ve honed our skills in a particular craft or technique. 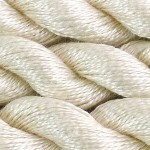 Ranging from the finest 60/2nm for delicate hand or machine embroidery, lacework, tatting and weaving to the 2.5/2nm which is a soft aran knitting weight yarn for adding some luxury to chunky work. 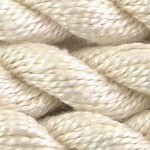 All thicknesses can also be woven, used for luxurious braids and tassels, knitted and crocheted, couched or used to stitch embroideries. They can all be dyed beautifully with either hot or cold water dyes or painted with silk paints and will retain their lovely glossy surface. SS25 (Aran) - Knit on 5mm pins - 18 stitches & 24 rows, SS5 (DK) - Knit on 4mm pins - 22 stitches & 28 rows, SS8 (4ply) - Knit on 3.25mm pins 28 stitches & 36 rows, SS16 (2ply) - Knit on 3mm pins - 34 stitches & 42 rows. All to a 10cm square.